In grade school, you probably learned about pharaohs who were buried with treasure, clothing and furniture, the occasional pet. It's hard to know what you'll need when you cross into the great beyond -- and whether there will in fact be snacks. 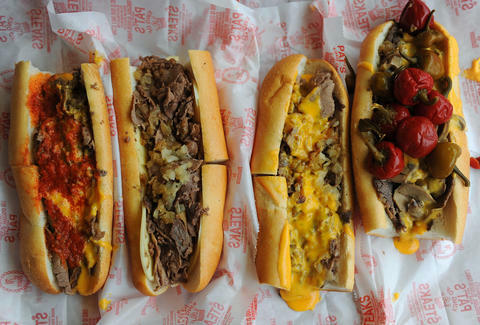 Well, a Pennsylvania man totally outdid all those ancient kings, when he made the ultimate commemoration to his love of bread and meat and cheese: By his request, he was buried with not one, but two Philly cheesesteaks. Richard Lussi, a 76-year-old who recently died from heart complications, used to joke that he'd like to bring a Philly cheesesteak to the afterlife -- without onions because they'd come back to haunt him, his grandson told Philly.com. Not any old cheesesteak would do, though. He specifically loved Pat’s King of Steaks, which he'd first eaten before a Phillies game decades ago. The shop was over a two-hour drive from where he lived, so he'd often dare his children to make the drive and pick them up at family gatherings. The day before his October 14 funeral, his son, grandson, and two of his son's friends drove out to Philadelphia to eat cheesesteaks in Richard's memory and to pick up two just for Richard, who said that making the drive for just one was a waste. The next day, the funeral director advised them to wait to put the sandwiches in the casket "because people would take them," so after the viewing, the sandwiches were placed near his hands. Richard's son John told Philly.com that some people were surprised, but the people who really knew Richard understood. May we all love something this much. James Chrisman is a News Writer at Thrillist who plans to eat a cheesesteak soon in Richard's honor. Send news tips to news@thrillist.com and follow him on Twitter @james_chrisman2.